Starring: Jennifer Lawrence, Bradley Cooper, Robert De Niro, Edgar Ramirez, Virginia Madsen. Jennifer Lawrence stars in the inspirational true story of a woman who built a business empire. 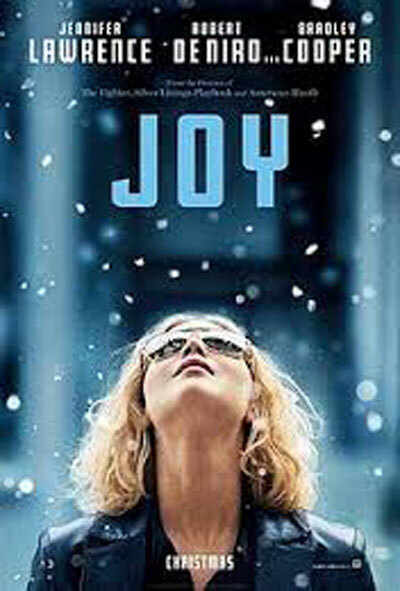 Burning with ambition, Joy (Jennifer Lawrence) is ill served by around her. Her parents (Robert De Niro, Virginia Madsen) are divorced and her husband (Edgar Ramirez) is a flake. Before long, she's a single mother striking out alone as an inventor and entrepreneur. But success brings its own problems, not least the unwanted attention of criminals. Inspired by the true story of Joy Mangano, inventor of the Miracle Mop, 'Silver Linings Playbook' and 'American Hustle' director David O. Russell has crafted a brilliant star vehicle for his favourite actress, Jennifer Lawrence. Bradley Cooper, with whom she has demonstrated such amazing screen chemistry, is cast as a Home Shopping Network executive who gives Joy's career a boost. Unfolding over four generations, this is a deeply emotional story of family, love and the tough world of commerce.